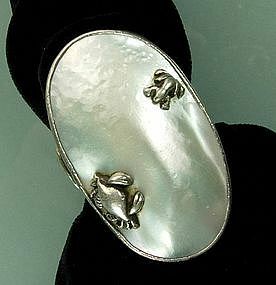 Beautiful and rare early signed Carl Schon Baltimore silver and mother of pearl ring. With a huge bezel set mother of pearl piece with a three dimensional crab and frog facing each other, with asymmetrical dimensional shell motifs on each side of the shank. Carl Schon, not well known outside of Baltimore, was a jeweler and decorative arts metalware maker, working in an Arts & Crafts and transitional/Art Deco style, from the late 1890s until his death in 1923. Later Carl Schon pieces were made by the firm which continued under his name. This piece is very early, 1900-1920. It has the early Schon signature. It is adjustable, as was common for rings in the early 20th century. It has a fabulous worn and patinated finish which attests to its age. An exceptional piece and one which you won't see again soon. Great size -- the top is 1 5/8 inches long by 1 inch wide. Heavy and substantial at 19 grams. Currently at ring size 6. Although it is adjustable, any changes to the size should be done by a professional jeweler. Excellent condition. Photos enlarged to show detail.